Kérastase is one of my favourite haircare brands and has been for years. 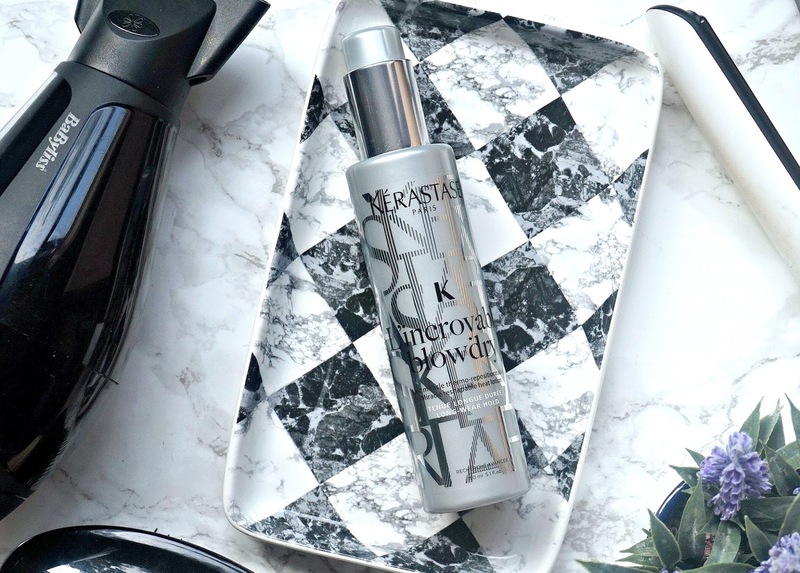 I have used a number of their shampoos, conditioners, heat protectors and oils and there have only been a few products that didn't hugely impress me so I had high expectations for their latest styling release: Kérastase L'incroyable Blowdry. This is not just a heat protectant, but is also a styling product that promises to retain the style/shape for a number of days after use. Because I only wash my hair twice weekly, I was intrigued by this claim and also hopeful. So does it live up to its claims? Well, I guess the title of this post gives it away but keep reading for my full thoughts! This lotion is applied to damp hair before blowdrying and it has a cream-lotion texture so I was initially worried that it might weigh my hair down because I have previously used lots of products that made my hair feel heavy and would inevitably make it greasy within a day. No such worries with this product! I use around 2 small pumps and distribute it throughout my hair and it honestly feels weightless. The first time I used it, I was seriously impressed by how smooth my hair was after drying - it looked as though I'd had a salon blowdry, and wondered if it might be another of those products that works brilliantly the first time but is less impressive the next time it is used, but that is not the case. I am more impressed every time I use it. I have used styling products in the past that claim to keep the hair styled until the next wash but they never quite lived up to that promise for me (or if they did I could feel the products in my hair or it made my hair a little dry), but this is completely different. I tie my hair up when I get in the shower or have a bath and usually that will leave it with kinks but since I started using this product, that has changed. My hair stays completely straight and kink-free until I next wash it leaving me super impressed! It is a heat-activated product so will be of no benefit to anybody who lets their hair dry naturally. It is also re-activated by heat tools so if you straighten your hair one day and curl it the next, you will still benefit from the product. It is said to control frizz in humidity but I haven't been able to test that claim given that it is anything but humid in Ireland at the moment but I will bring it on holiday later this year. I usually wear my hair straight but used a curling wand to achieve some loose waves in order to test this product further and to my delight, I found that the waves lasted 3 days until I washed my hair again so that will encourage me to do this more often as I hate wasting time styling my hair only for it to only last a few hours or a day at most. Overall, I am crazy about this product - it does exactly what it promises to do. It keeps my style for around 3 days, it doesn't weigh my hair down, my hair is not stiff and doesn't feel full of product and it looks like it has been professionally blowdryed. Given that I use such a small amount, I can see this bottle lasting me for the best part of a year. It is available from Feel Unique, Look Fantastic, HQ Hair, Shampoo.ie and all Kérastase stockists. This post is not sponsored - I bought the product with my own money. Do you like the sound of this product? Is it something you would like to try? Have you used anything similar? I'd love to hear in the comments below!